One can never have enough security in their home, but if you’re looking at wanting more than just an alarm system you may want to consider getting a movement sensor. Here at My Deal we stock a large range of devices that add crucial value to your current basic home security system, from gate door alarms to smoke alarms we have you covered. For the super high tech individuals, or those who are wanting absolute surveillance the Yale Wireless PIR Video Camera is the perfect option. 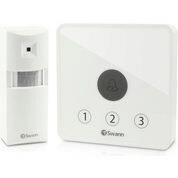 Ideal for securing a single room, this accessory activates the alarm system and captures a 10 second video clip when someone moves around your home. It has a super user friendly play, plug installation and can record a video clip on request. Worried about a break in? The Watchguard Wireless Glass Break Sensor Detector provides extra protection to your property with this wireless glass break sensor. It also uses a high-precision microphone which detects glass breaking up to 7 metres away! With our large range of home security options you are bound to find the perfect option for your home. Stress less and protect your house the best possible way you can and invest in a high tech surveillance device today. Here at My Deal we understand just how busy you are and running to the mall during the week just might not be an option, that’s why we make things simple and let you shop online. All you have to do is browse, buy and then let us do the rest! We ship to major cities very quickly so you can rest assure your security system will arrive on your doorstep in no time at all! If you have any questions regarding our product range you can contact our friendly customer service line on (03) 9998 6805.